The retina is covered in light-sensitive cells which alter the voltage on their membranes according to the brightness that impinges on them. The light-sensitive cells are connected to neurons in their immediate vicinity that perform some local processing before passing them on to the brain. The processing cells each send out an axon that travels directly into the brain. Many go to an area near the back of the head called the superior colliculus in mammals. The axons of the retinal ganglion cells all run parallel to each other as a thick cable — the optic nerve — but when they reach the superior colliculus they disperse and connect to it in a quite remarkable manner; the place to which each one connects to the colliculus depends, in a precise way, on each ganglion cell’s place in the retina. 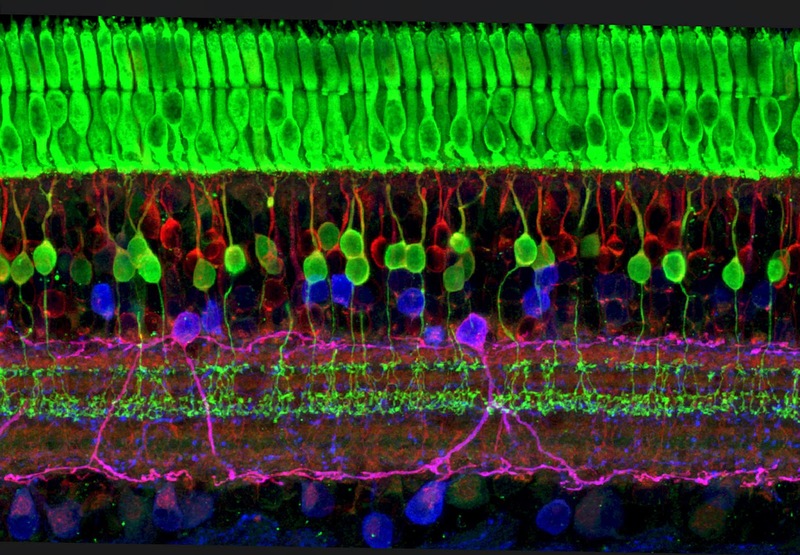 In effect the exact layout of the ganglion cells on the retina is replicated on the colliculus so that it has a fully laid-out image, in electrical activity, of the optical image that is present at the back of the eye.